At a bend in the Thyme Track, on the right-hand-side, there is a cliff of hard-packed earth. In it is a succession of holes. The largest is 10 inches wide and has a pile of loose earth underneath, proof of a resident. This, we think, may belong to a badger though it is three foot or so above ground level. No identifiable footprints though. 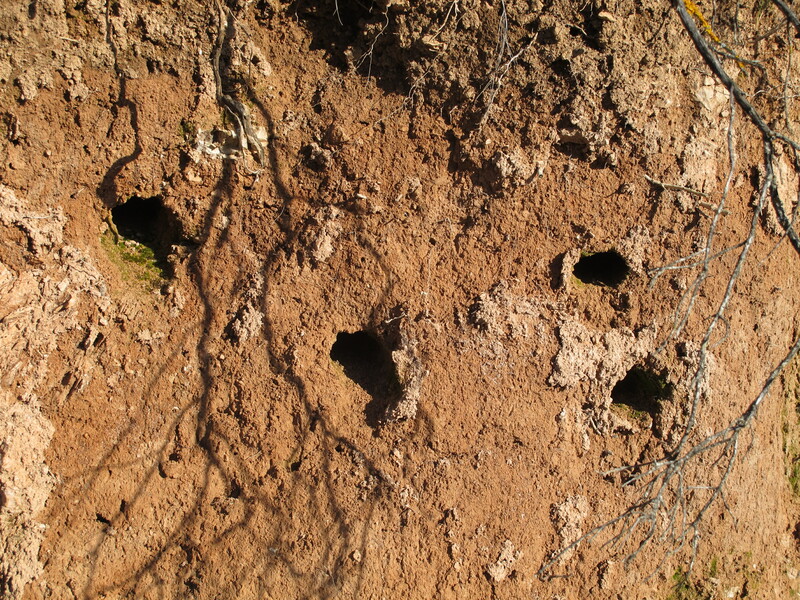 Nearby is a series of smaller holes which we at first thought may be home to sand martins, but which we now think may be bee-eater nests. Last summer we watched bee-eaters through our binoculars, nesting in similar holes in a sandy bank on the opposite side of the valley. Bee-eaters are regular visitors here, arriving generally at the end of March and staying until late August. Listen to the song of the bee-eater here. This entry was posted in Nature and tagged Andalucia, nature, photography, Sandra Danby, Spain, wildlife on March 21, 2013 by sandradan1.